Brandneu und modern, voll möbliert, 2 Schlafzimmer, 2 Badezimmer, geräumige Wohnung direkt am Yarra River mit herrlichem Blick auf den Melbourne River und die Stadt (7. Etage) direkt gegenüber dem Fluss von Kew. Dieses hochmoderne Apartment befindet sich in einem Resort / Health & Wellness-Retreat mit einem beheizten Sportbecken, einem Whirlpool, Whirlpools und einer Sonnenterrasse mit Blick auf die Stadt Melbourne, einem Fitnessstudio, einer Sauna, einem Kinoraum, einer Dachlounge und einem Unterhaltungsbereich mit BBQ's, Lobbybar, Business Center, Sitzungssaal, Außen- und Innenkamin und mehr. Dies ist der ultimative kosmopolitische Rückzugsort! Die erste dieser Qualität in Melbourne direkt am Yarra River !!! Großartige Lage - Victoria Gardens Shopping Center auf der anderen Straßenseite, umgeben von Cafés, Restaurants und direkt an der Straßenbahnhaltestelle. We spent 4 weeks in this wonderful apartment! It had a fully stocked kitchen. Plenty of towels for use in the apartment, at the hot tubs and for the beach. The view was amazing! Several times we watched hot air balloons float by and some landed right next to the building. The building is safe and secure and the other tenants are very friendly. We loved having the shopping mall just across the street. The grocery store is amazing! The tram stop was just a 2 minute walk from the front of the building. We also found it easy to navigate from this location in our car. The hot tubs were a great way to relax after a long day of sightseeing. The beds were comfortable and there was plenty of bedding and pillows. The apartment was well stocked with garbage bags, cleaning supplies and laundry supplies. It made our stay so much for comfortable. We highly recommend this place. The owners made sure we had everything we needed, and that we could contact them if there was a problem. Home away from home with everything included! Angela and Rael have done a fabulous job with this condo and have another one in the center of the CBD that is also fabulous. My husband and I spent a month here and loved this apartment. Angela has thought of everything you could possibly need in the kitchen, including every cooking pot, pan and utensil with several coffee makers to choose from for the coffee connoisseur. There are loads of bowls, dishes, glasses, and silverware. If you love to cook, this is the place for you. If you don’t love to cook, there is a mall across the street with lots of food options as well as 2 breakfast/lunch restaurants located in the apartment complex and one right next door. If you are a Swedish meatball fan, there is an IKEA across the street with its own restaurant. The building has a pool and a gym but we were too busy to use either of them. The tram stop with two different trams going into the CBD is literally right outside your front door and will take you downtown in 10 minutes. The Yarra river runs just behind the building with a paved walking/cycling path that goes all the way to the CBD (about 6 miles walk or ride). We actually walked all the way to the city once and it was a great way to spend the morning. There are bridges along the way that connect to fun neighborhoods to explore. The bedrooms and bathrooms are very well appointed with fun furnishings, artwork and lighting. There is enough bedding and towels in the closets to last you for weeks. The washer/dryer work very well. The beds are comfortable and the apartment is very quiet with the doors and windows closed. We will be back next year and will most definitely stay here again. Thanks Angela and Rael!!!! The property is very well set up with comfortable furnishings. Washing machine, dryer & dishwasher very handy! IKEA just across the road. Tram on your doorstep to the city. Car parking & entrance to building very secure. Do yourself a favour & have breakfast downstairs next to the river at Kitty Burns! The apartment was sumptuous as well as being spotlessly clean. The kitchen in particular had every gadget under the sun! Angela was extremely helpful from initial contact right through to the end of our stay and gave a detailed tour of the apartment and the facilities, all of which were first class. The sizeable balcony with a dining table and chairs was great for sitting out in the evenings eating dinner overlooking the Yarra River and the Melbourne skyline  this provided great views of the New Year Fireworks. The hot tubs on the roof in particular were a hit! There was also a heated lap pool with spa, gym and sauna which was great for chilling out. 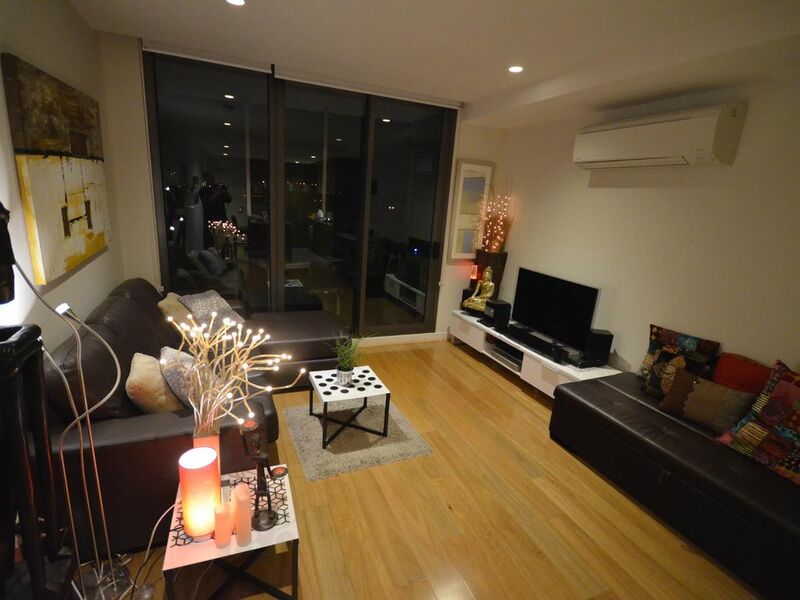 The apartment is just a short walk from the busy Bridge Road in Richmond with lots of bars and restaurants and there was also a tram stop right outside providing easy access to the CBD, there is also a shopping centre just across the road with a supermarket, food court and a large variety of shops. The pop up caf downstairs was very handy for those mornings where we were too lazy to make our own coffees! Cannot recommend this accommodation highly enough, in my 40 years of travelling this is the best apartment I have ever stayed in.